The Colic Risk Rater healthcare tool was performed by over 100 students in the winter 2018 offering of Equine Guelph’s Gut Health & Colic course. Feedback indicates participants were keen to learn the simple management changes that could reduce their chances of colic. Many were surprised to learn that approximately 80% of colic episodes may be related to management and therefore can be prevented. Available on the Equine Guelph website, the free Colic Risk Rater tool provides individual feedback to help horse owners identify risk factors and develop preventative strategies to help reduce the risk of colic. ‘Concentrates’ are broken down by enzymes in the foregut for the horse to digest, while forages are broken down by the microbes in the hindgut and it is the microbes that feed the horse. Therefore, it is even more critical to change forages more slowly than concentrates, in the horse’s diet. In spring, there is the introduction of grass pasture to consider. If we let the horse out on pasture when the grasses are beginning to grow, Mother Nature helps control the intake of this new, very digestible, ‘short forage, as it begins to grow very slowly. Problems arise when the manager waits until the fresh grasses are 3 to 4 inches tall before turning the horses out to eat it. 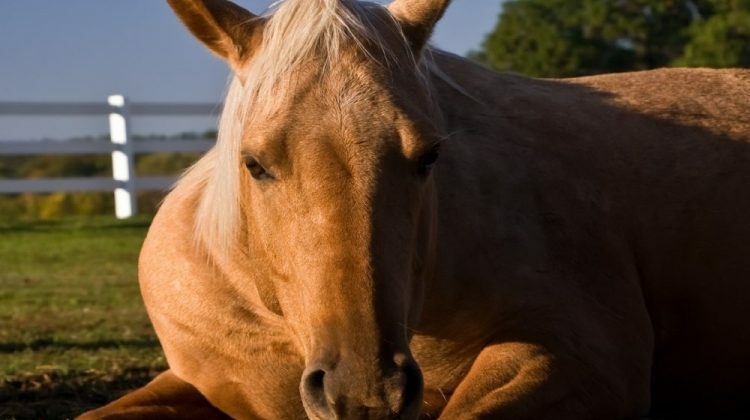 Then the horse can consume too much at one time and cause a digestive upset, i.e., colic. However, not every farm owner has an ideal ratio of one horse per 1.5 -2 acres of grazing in which case special pasture management includes rotating horses to new paddocks before the grass is eaten down below 3 inches. In these cases, introduce horses to fresh grass with gradual increases in grazing time. If stools begin to loosen, you know that grazing time was increased too much. Back off the time spent grazing and be sure to provide the horses with extra hay when off the pastures. This allows them to chew more, which will produce more saliva thereby controlling pH levels which helps the good microbial population stay healthy and restore the ‘good’ bugs in the gut. Moist stools could indicate a well hydrated horse, but if it becomes too loose and is accompanied with a strong ‘acid’ aroma, it could indicate something has happened to the microbial population in the colon. One of the jobs of the colon is to absorb water and form the feces, but the microbes found there are very pH sensitive, therefore, a ‘hindgut irritant’ caused from eating too much starch or sugar; lack of adequate fermentable fiber; or extended treatment of antibiotics, could cause ‘Acid Gut Syndrome’ that could lead to ‘Acidosis’. Unfortunately, acidosis is when the pH of the colon becomes <6.0 and this is when 80% of the horses will founder. The most common cause of ‘Acid Gut Syndrome’, during a change of season, is a change in the forage they are eating. This could be from: 1)transitioning from mature grass hay to immature grass pasture, or visa versa; 2) feeding a different ‘type’ of hay (remember it takes different microbes in their fermentation vat to breakdown the different ‘types’ of forage). To make a 100% microbial change in their fermentation vat, i.e. hindgut, takes 21 days. Therefore, to maintain a healthy gut, it is more important to change your ‘forage’ more slowly than your concentrate feed. Visit Equine Guelph’s interactive Colic Risk Rater healthcare tool to learn how you can reduce your horse’s risk of Colic.